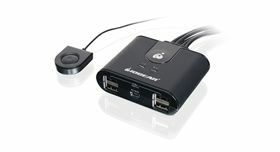 A USB switch allows two or more computers to easily share a USB peripheral such as external hard drives, printers, and scanners. The USB switch saves you cost and space on additional USB devices. On the other hand, it eliminates the need to unplug the USB peripheral from one computer and then plug it into the other. By using the USB switch, you do not need to set up the complicated network just to share a USB device. Simply press the button on the USB switch, the USB device is instantly available to serve any computer connected to it. No software installation required. Some USB switches also support Auto-Switch function when used with USB-enabled printer or printing function on a MFP (multi-function printer). With the switch software installed on connected computers, you simply send the print job and the switch will automatically makes the swap for you. This can be handy when the USB switch is located behind the desk or somewhere hard to reach. 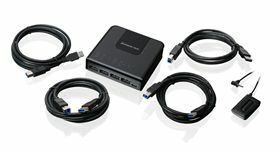 IOGEAR's 4x4 USB 3.0 Peripheral Sharing Switch provides a convenient means to share four USB devices between four different computers. A simple press of the button changes the connection of four USB devices such as keyboard, mouse, printer, portable hard drives, etc. from one computer to another. 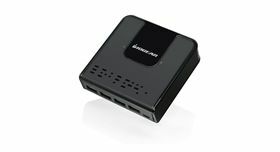 The IOGEAR 2x4 USB switch is a USB 2.0 peripheral sharing switch that allows two computers to share up to four USB devices, such as a keyboard, mouse, printer, portable hard drive, etc. 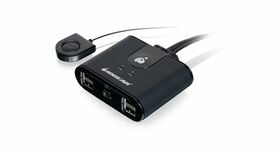 The IOGEAR 4x4 USB switch is a USB 2.0 peripheral sharing switch that allows four computers to share up to four USB devices, such as a keyboard, mouse, printer, portable hard drive, etc.